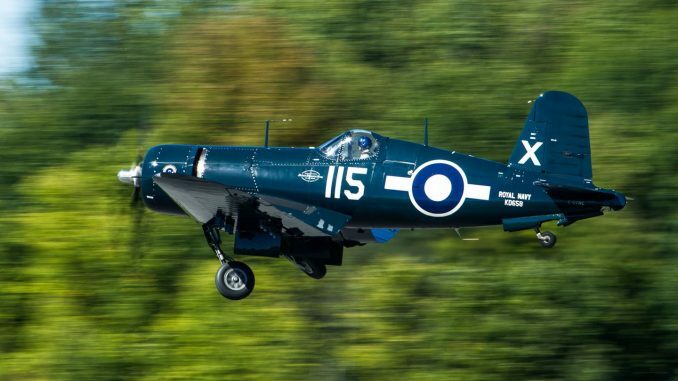 GossHawk Unlimited return a Consolidated Privateer back to the skies. 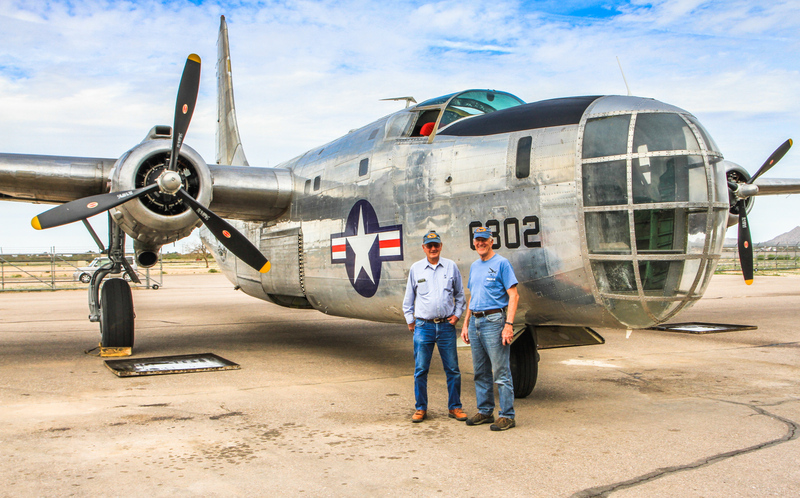 With the recent first post-restoration flight on February, 20th of a rare Consolidated PB4Y-2 Privateer in Casa Grande, Arizona, WarbirdsNews thought our readers would like to learn more about the project, as well as the company responsible for her care, GossHawk Unlimited. We talked with Lindsey Goss, who has been working on the Privateer since the retired fire bomber arrived at her father, Dave Goss’s shop a few years ago. 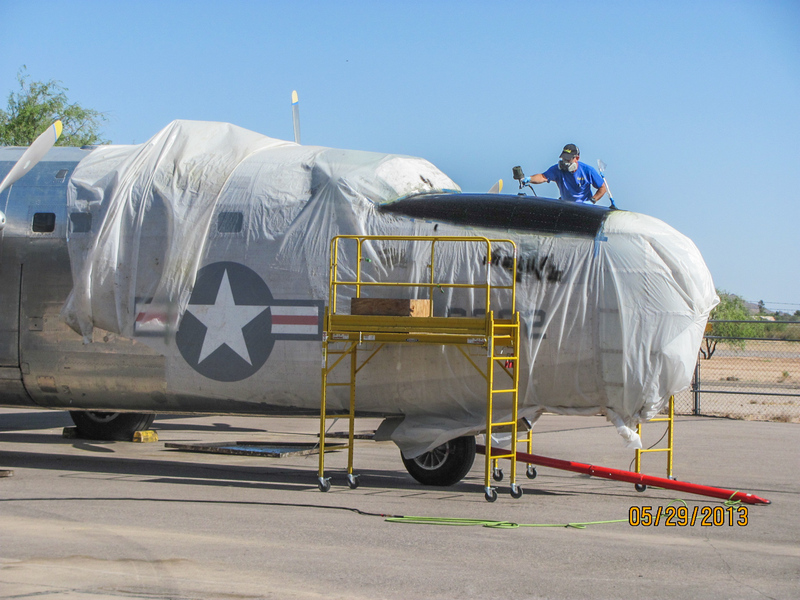 Owned by 4Y-2 LLC, the Privateer has been undergoing a sort of rolling restoration at GossHawk Unlimited. 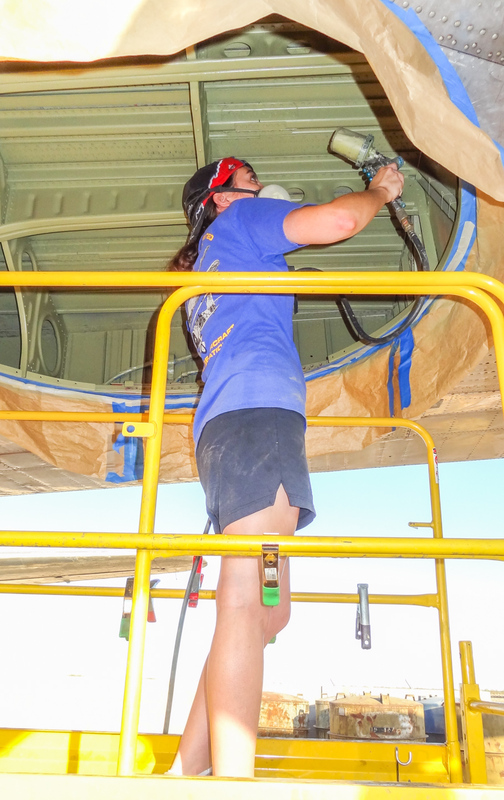 Rather than have the aircraft down for many years of deep restoration, there is a preference to perform ad hoc work while keeping the Privateer available for flying during at least some of the air show season. As Lindsey Goss stated, “She came to GossHawk in late 2010. 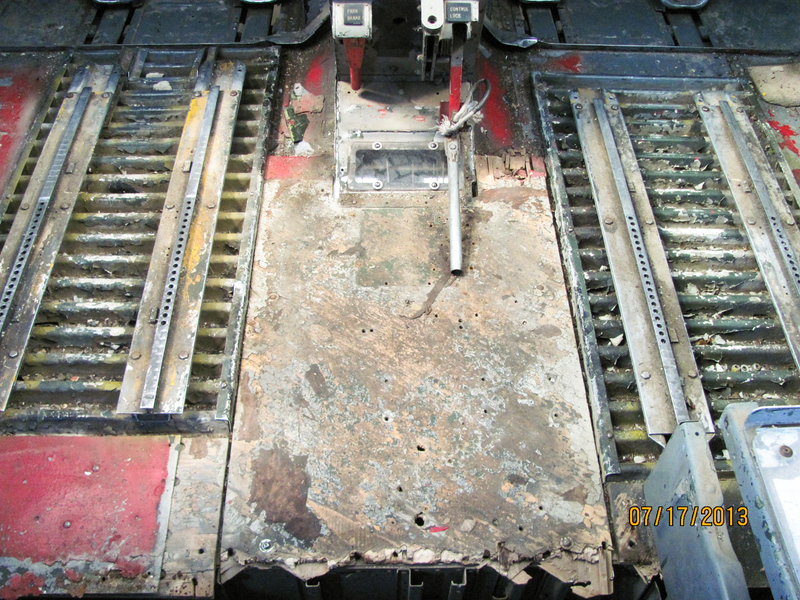 We have been doing ongoing restoration and maintenance since then. Seven or more guys have been working on the Privateer. 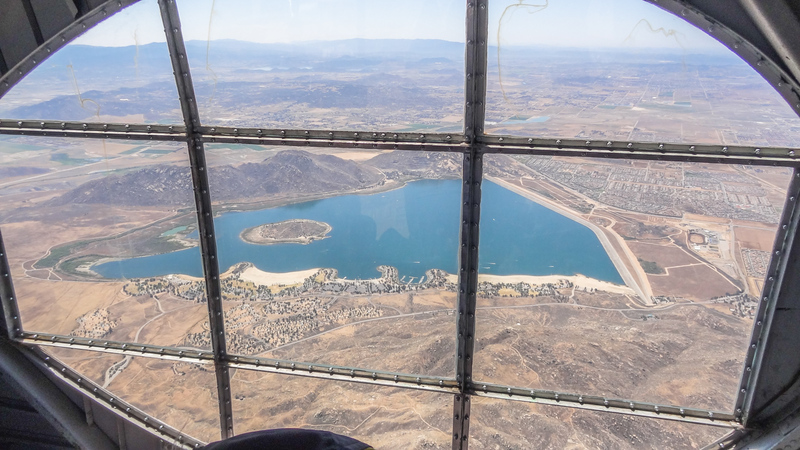 At times, all seven of us are doing the work, and at other times we have one to three people doing the work depending on the task at hand and timeframe before the next flight. 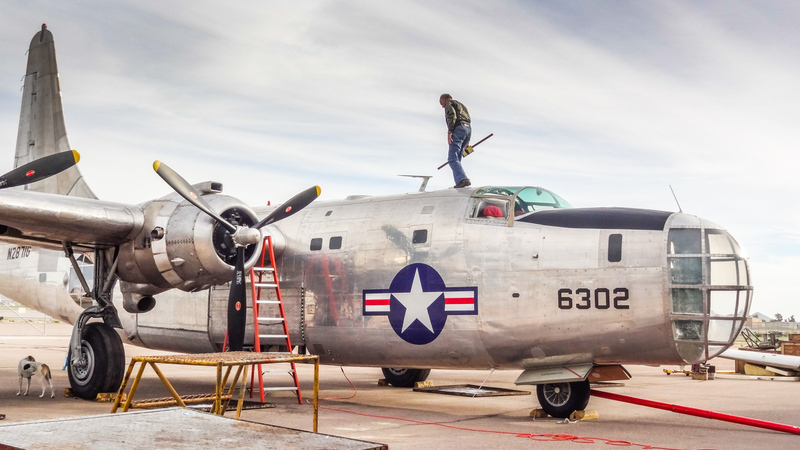 One of the first outwardly dramatic things to happen in April, 2013, for instance, was the removal of the old exterior paintwork from her decades of service as a fire bomber with Hawkins & Powers in Greybull, Wyoming. 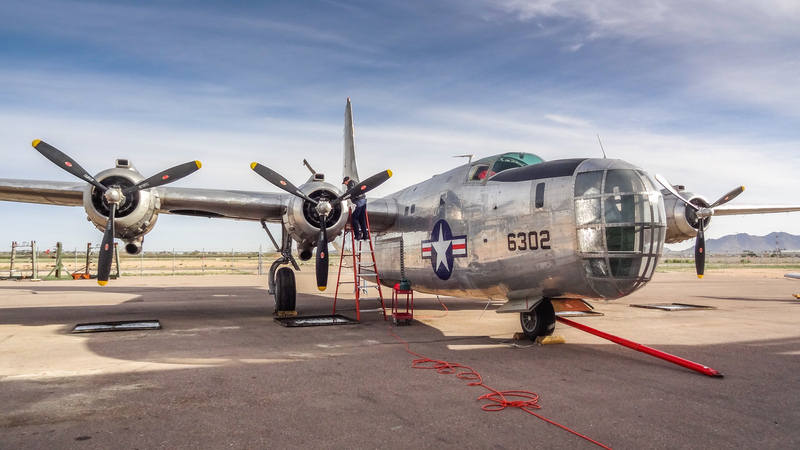 Brought back to a more authentic-looking, bare metal exterior, the aircraft feels a little more like her old military self now that a few national insignia have been applied to the fuselage and wings. The owners haven’t quite settled on what the final scheme will represent, whether it be for a US Coast Guard or Navy unit. 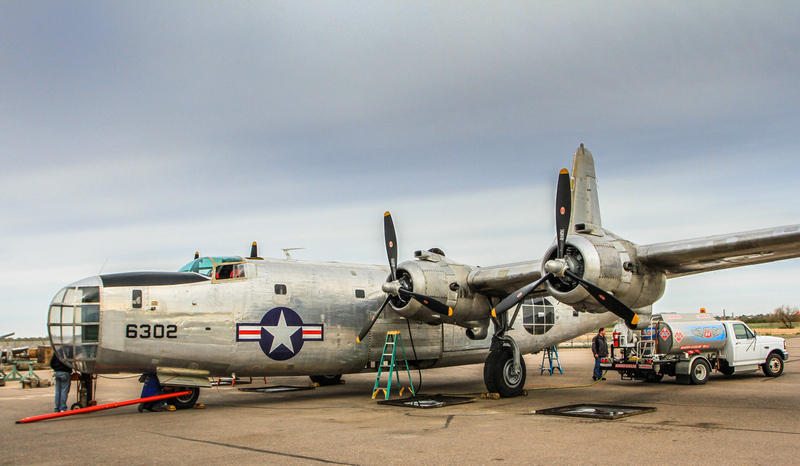 Structurally, the PB4Y-2 is configured more or less as she was whilst serving in the Coast Guard, but there is talk that the owners may choose to represent a Coast Guard squadron on one side, and a Navy one on the other, since if properly designed it would be nearly impossible to see both sides at the same time. 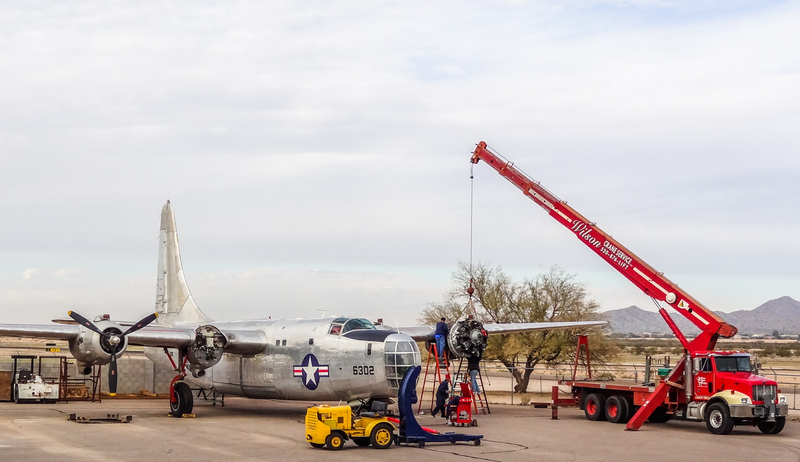 This option is not unprecedented either, as the RAF Museum in England once chose to represent both the RAF and Indian Air Force heritage of their B-24J Liberator similarly. 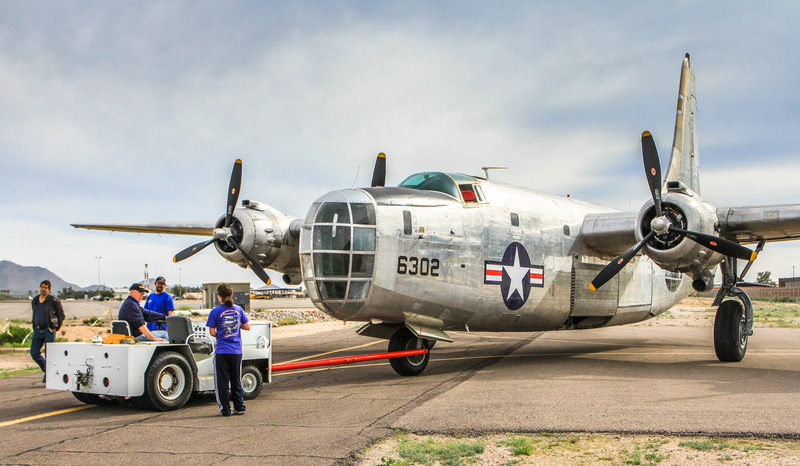 The PB4Y-2 is essentially a modified B-24N, so it wouldn’t be too different a problem to solve. 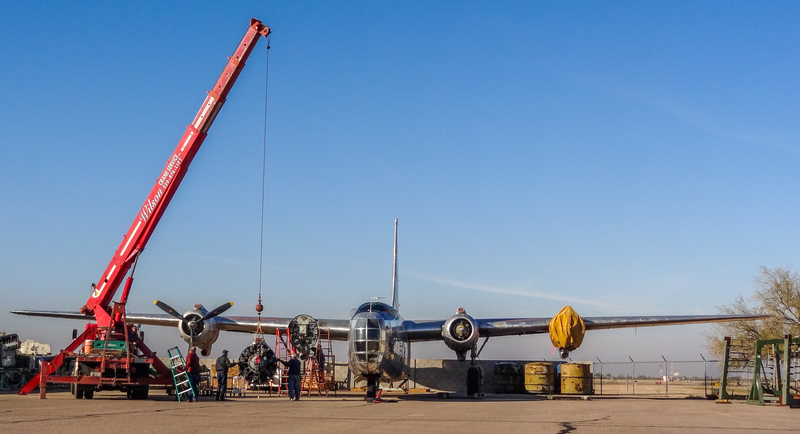 GossHawk has pulled the propellers one at a time for overhaul starting in September 2013, staggering the times so they were not all out and being overhauled at once. 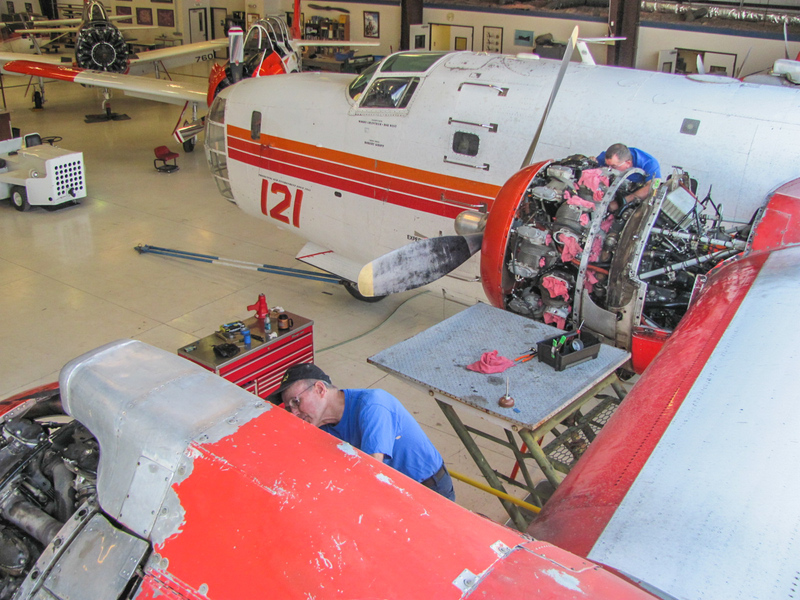 Tulare Aircraft Service in Atwater, California did the prop overhauls. The most recent work at GossHawk has been quite substantive. 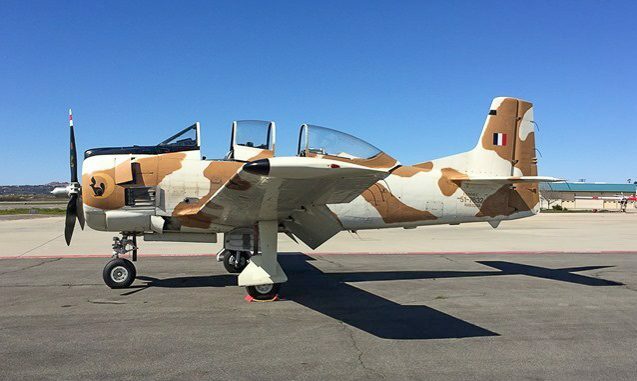 Until its recent flight, the aircraft had been ground-bound since returning from the Chino Air Show in May, 2014. 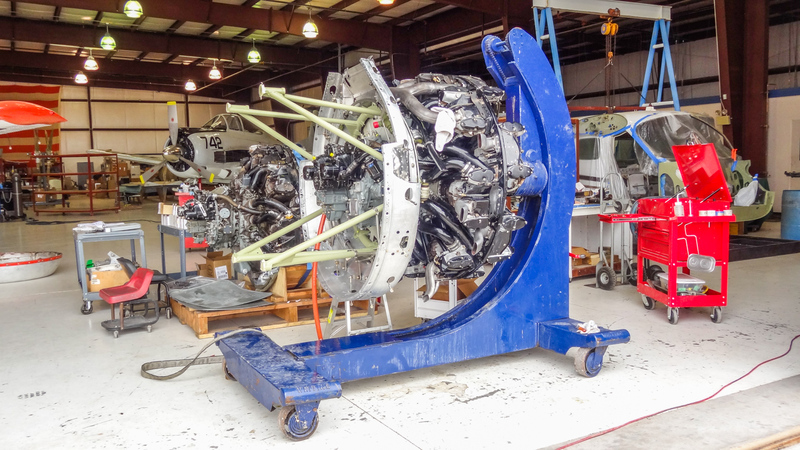 During the 60 hour inspection last July, a couple of the engines showed low compression issues, and upon further review, GossHawk decided they might need more comprehensive analysis. 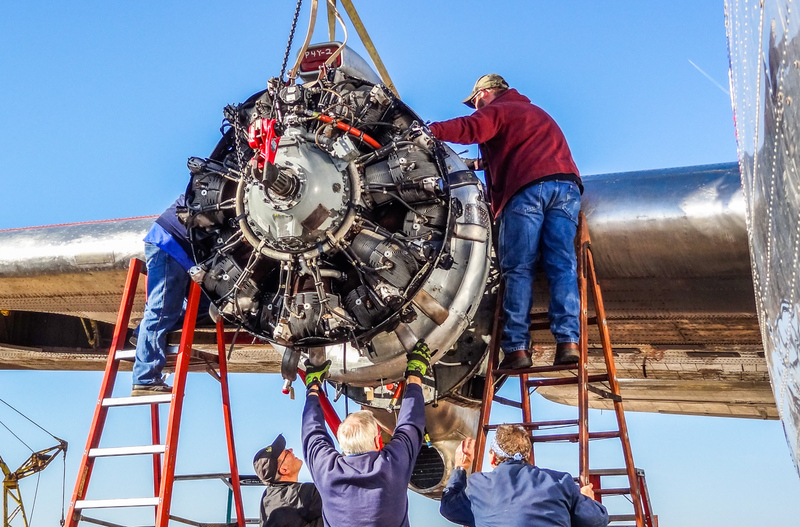 They removed the suspect #1 and #3 engines and their accessory sections and sent them to the radial engine gurus at Anderson Aeromotive in Grangeville, Idaho for a thorough inspection (which they ended up passing with flying colors). While the engines were off, GossHawk Unlimited made good use of the down time to work on other areas of the Privateer. Some of this work is best shown as a photo essay, so here are some of the images with captions which describe the work. 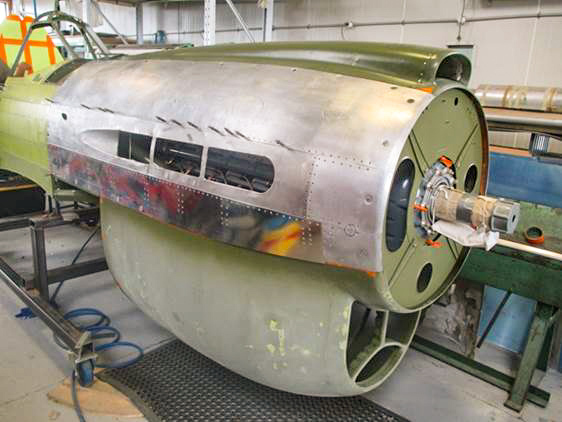 Just to give you an idea of some of the processes involved in maintaining such a large warbird, GossHawk Unlimited have to perform 30hr, 60hr, 12month, and 24month inspections and this includes, but is not limited to: compression tests, inspecting the airframe, inspecting all of the control surfaces, inspecting the hydraulic system, landing gear swings, and cleaning, testing, gapping, and inspecting all of the spark plugs, cleaned and inspected oil screens and fuel screens, and adjusted valves. 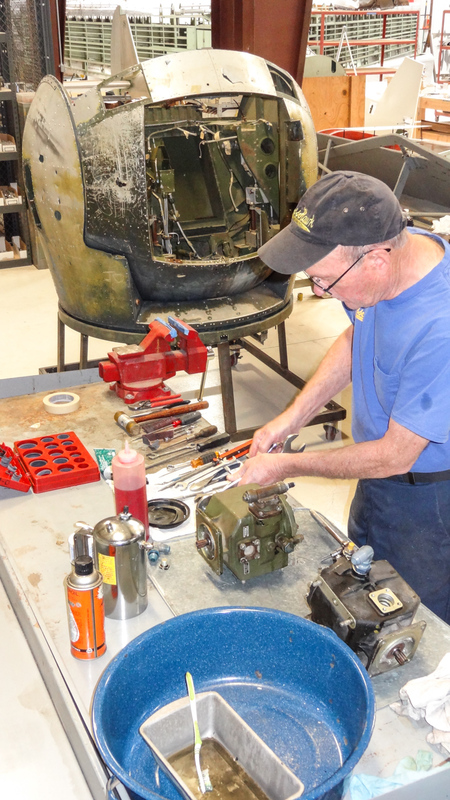 – pulling the carburetors for overhaul. 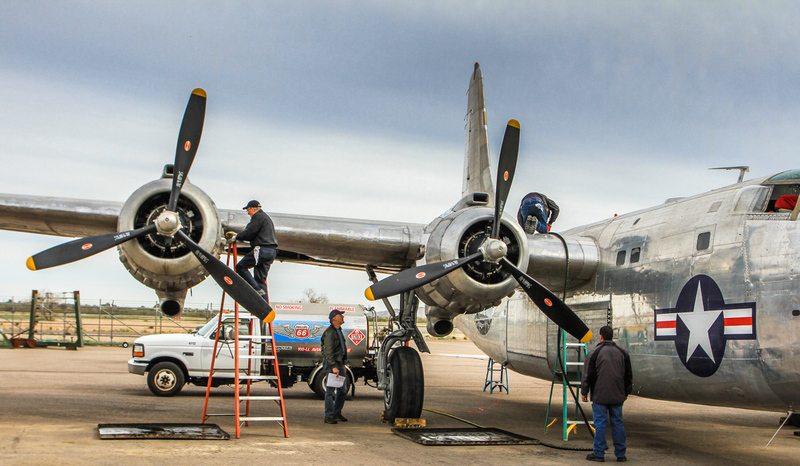 – washing the engine thoroughly to perform engine runs and check for leaks. – replacing all the fuel hoses. 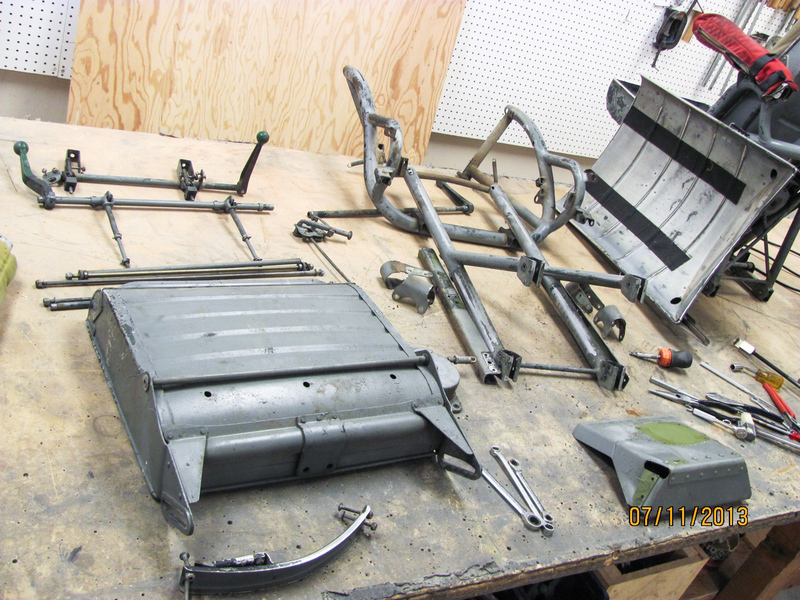 – continued engine maintenance: replaced a hydraulic pump, 2 magnetos, a fuel pump, etc., and other items as they come up. – installed a new radio package, including a GPS, transponder and comms. 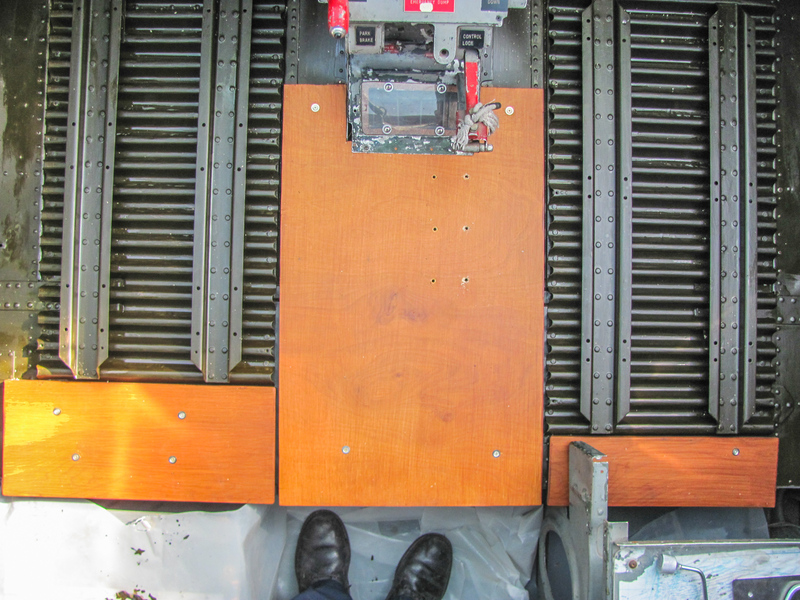 – rebuilt the left main gear retract actuator. 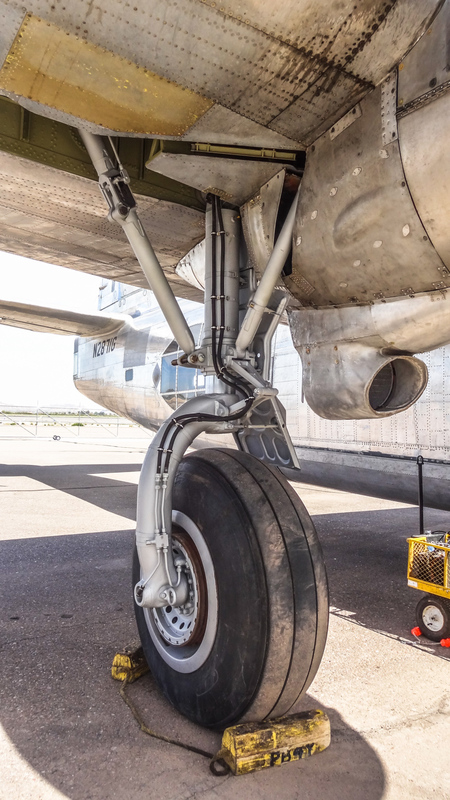 – repaired the nose wheel centering can. 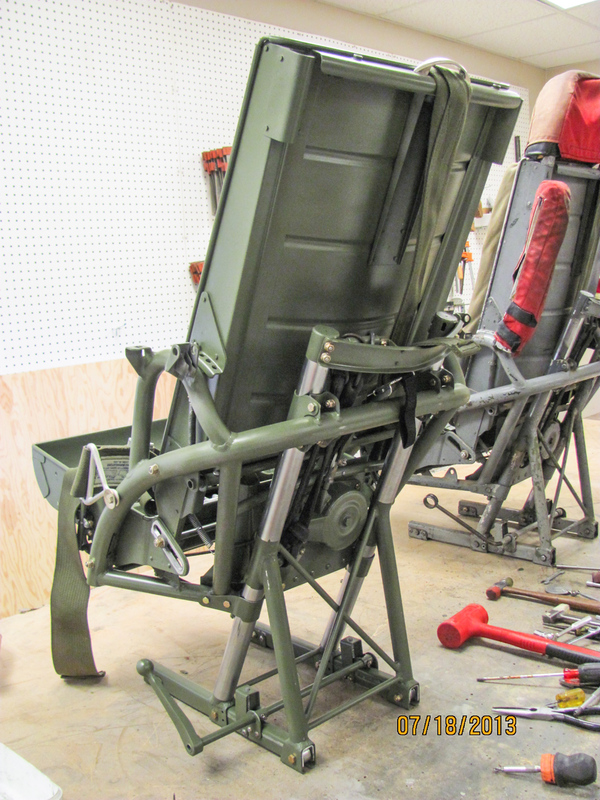 – rebuilt and adjusted the landing gear selector valve. 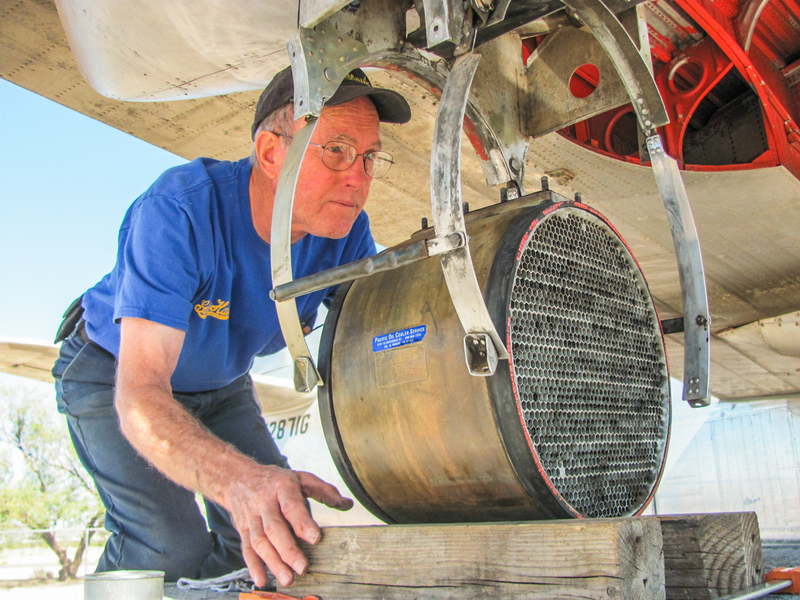 – adjusting the flap selector valve. As you can see, this sort of work requires a dedicated and highly skilled crew, not to mention a bucket-load of dollars to accomplish. 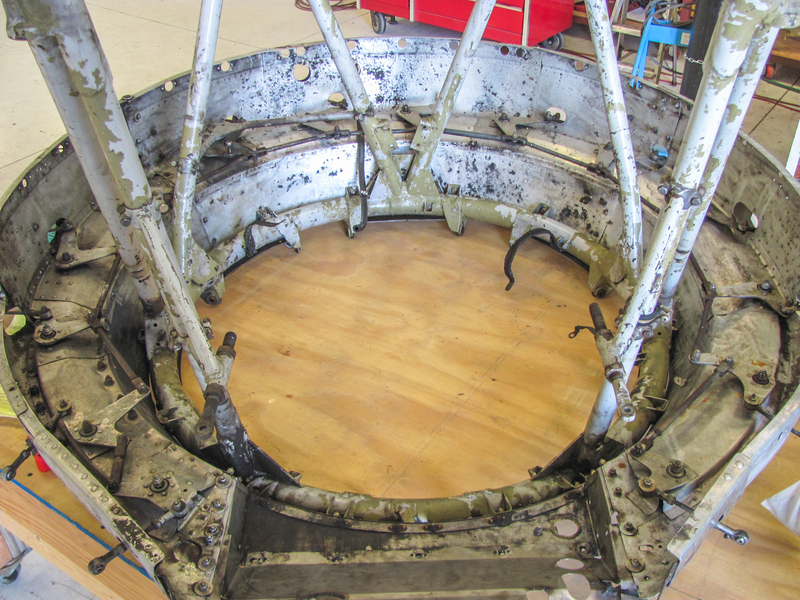 Anyone who thinks maintaining a warbird in flying condition is easy and inexpensive, hopefully now understands a little more of the complexities involved! 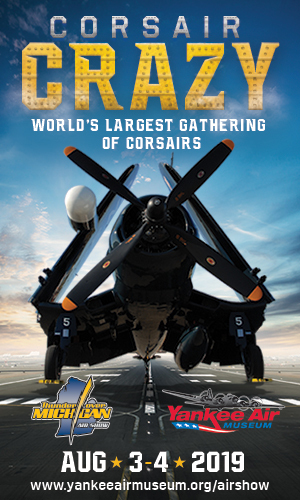 When asked what the main challenges were in doing the work, Lindsey Goss replied quickly – “The size of the aircraft. 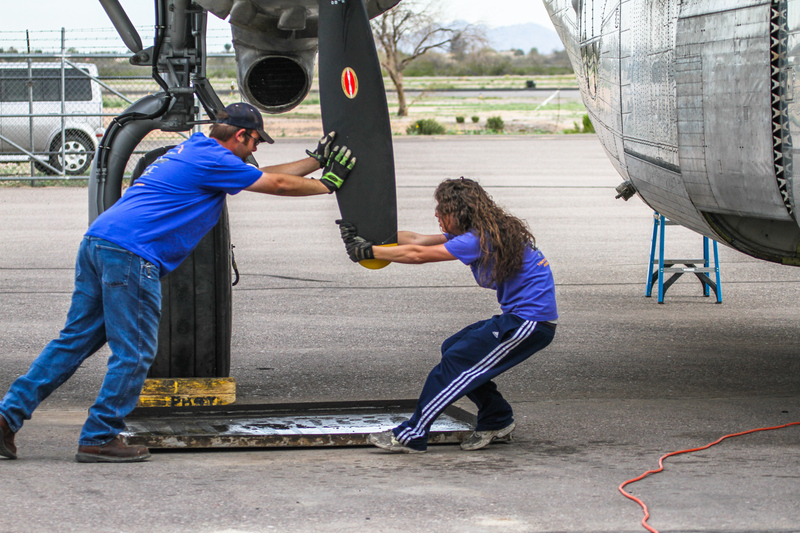 She is so big that she will not fit in our hangar, and this requires extra work to open her up and close her. 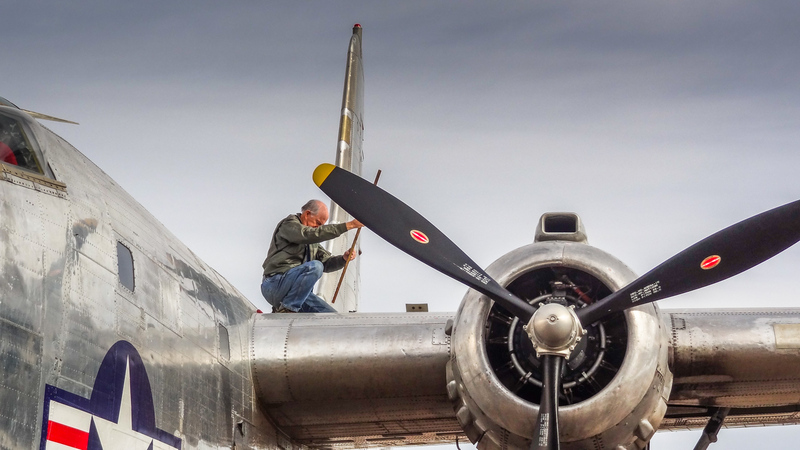 When the cowlings are off for engine work, the guys must tarp and untarp the engines each day.” She then added, “With the painting, the weather was often an issue. The painting was started in June and by 9:00am it is too hot to paint, so painting started at 4:30am. 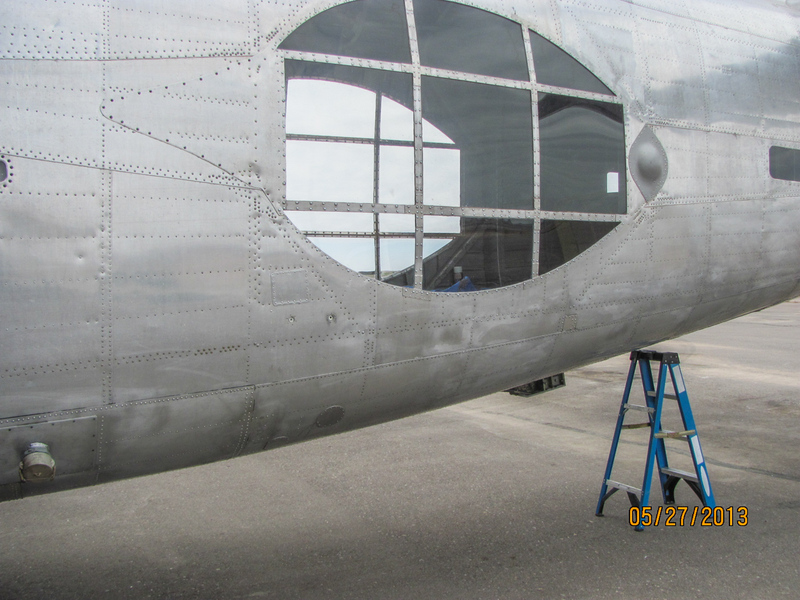 In the most recent months, it has been rainy and windy, so we had to wait for clear days to finish painting.” Other challenges included, “Waiting for a good, non-windy day to put her on jacks so that we could do landing gear swings and inspect the systems involved.” The engines are continually dripping oil, which is typical of radial engines, so the team are always chasing oil leaks and seeps. But the fun comes when you get to fly the beast, and these took place in late February. 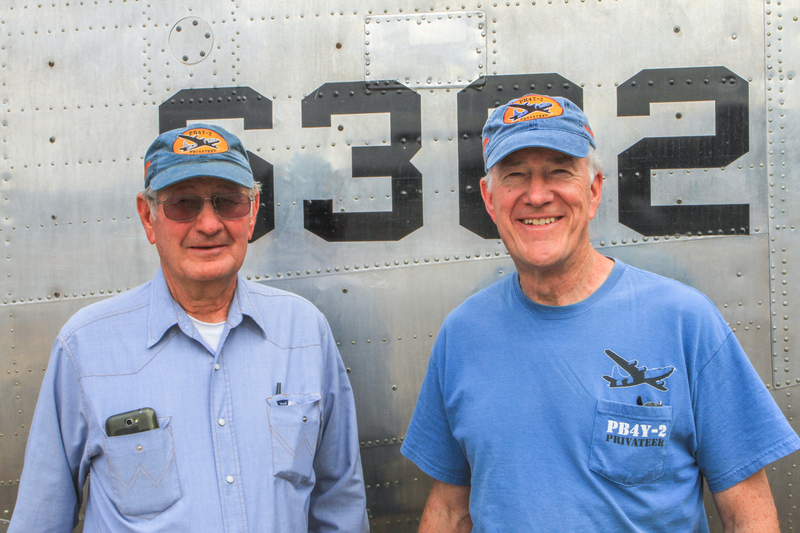 Former T&G Aviation Privateer pilot, Woody Grantham had the honors with Bruce Brockhagen as his copilot, and Dave Goss (IA, A&P, President of GossHawk Unlimited, Inc.) and Robert Kropp (crew chief) aboard for the test flights. 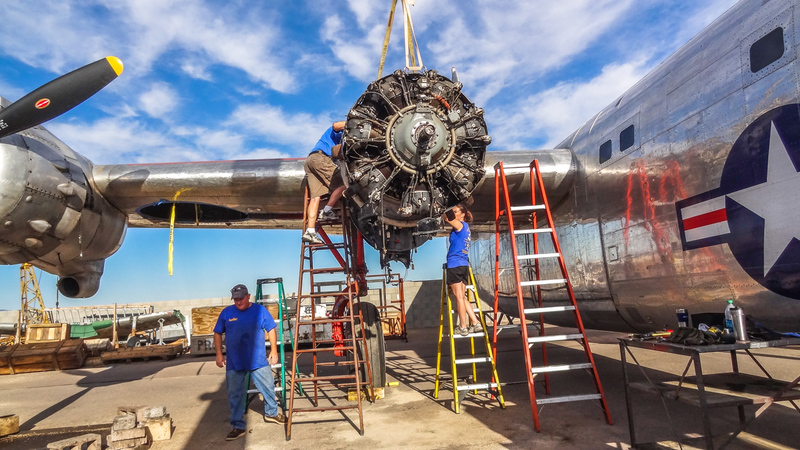 The flights went well, but as with every piece of complex, antique machinery, there are always a few things to take care of. 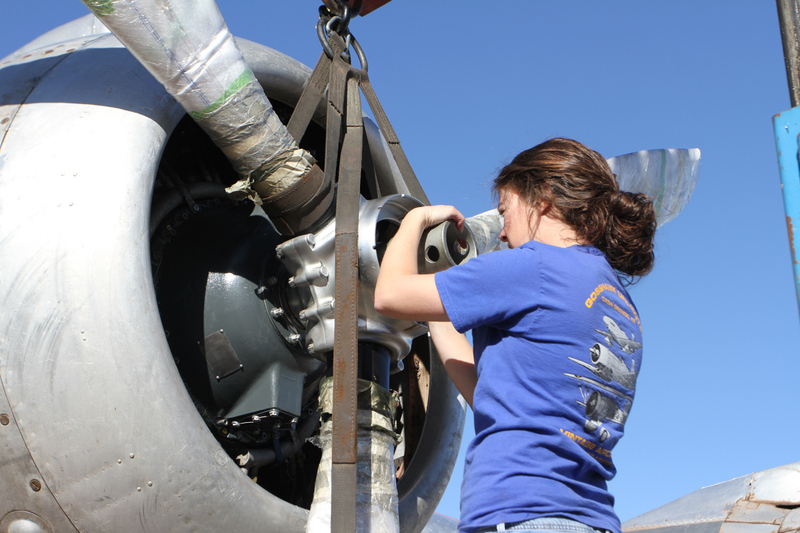 Squawks included: addressing a small leak around the #2 oil cooler, rigging the #3 throttle to match the other throttle positions, diminishing some background noise on the new radio, and resealing the right main landing gear retract actuator because it was slow to come up. 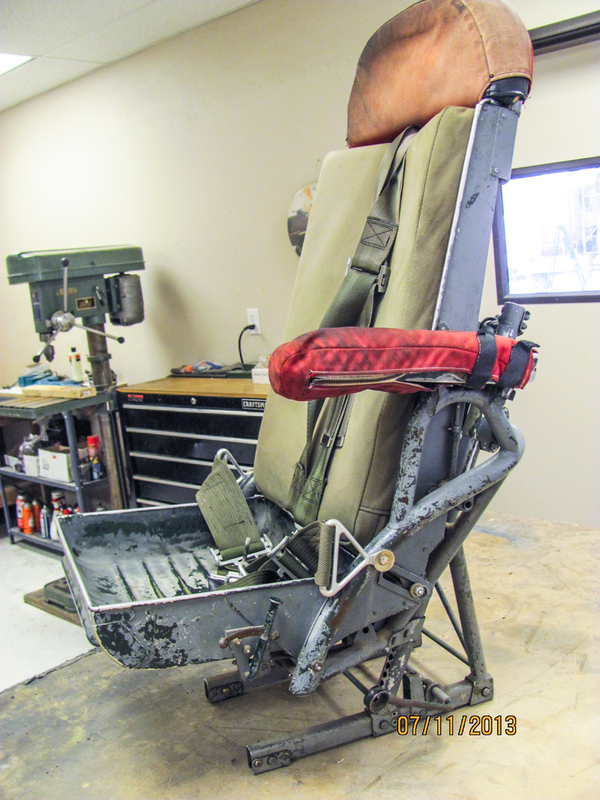 GossHawk Unlimited continues to work on several different projects in the shop, along with maintenance on other aircraft. 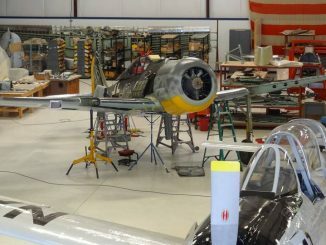 Some of the warbirds currently under restoration include the fuselage of what will become the second airworthy original Focke-Wulf Fw-190, a Flugwerk FW-190A-8/N and an Erco turret as used on a Consolidated PB4Y-2 (but not for the Privateer currently under care). 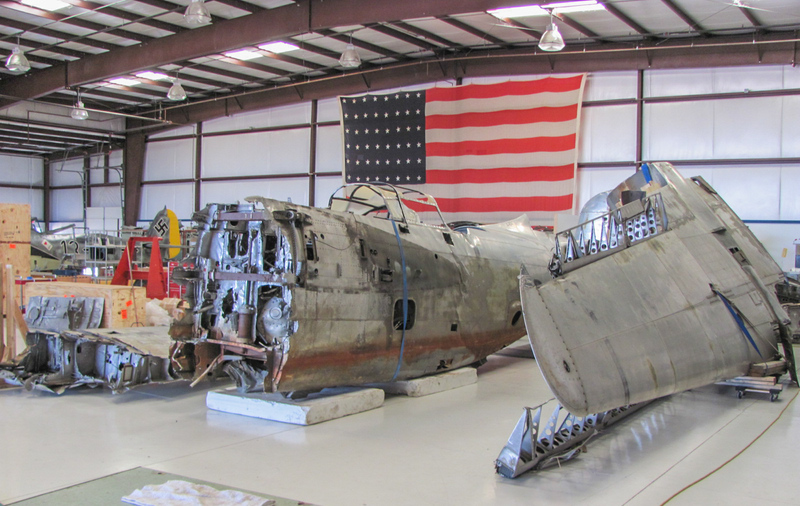 GossHawk also has a substantially complete Douglas A-20 Havoc project in the shop waiting for the right person to buy her and have her restored. Although, this will be a big project, the new owner will have a unique airplane. 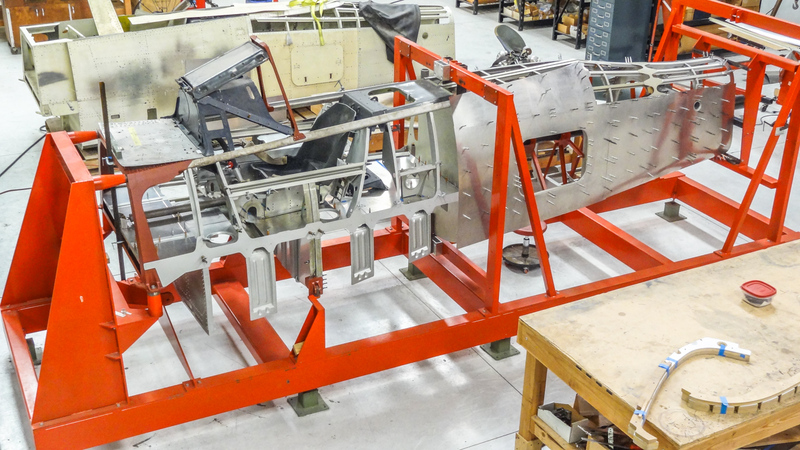 The original Fw-190 undergoing restoration is the F-8 variant known for many years as “White One”. 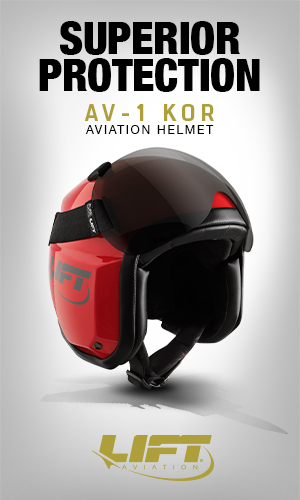 This will be for for the Collings Foundation. 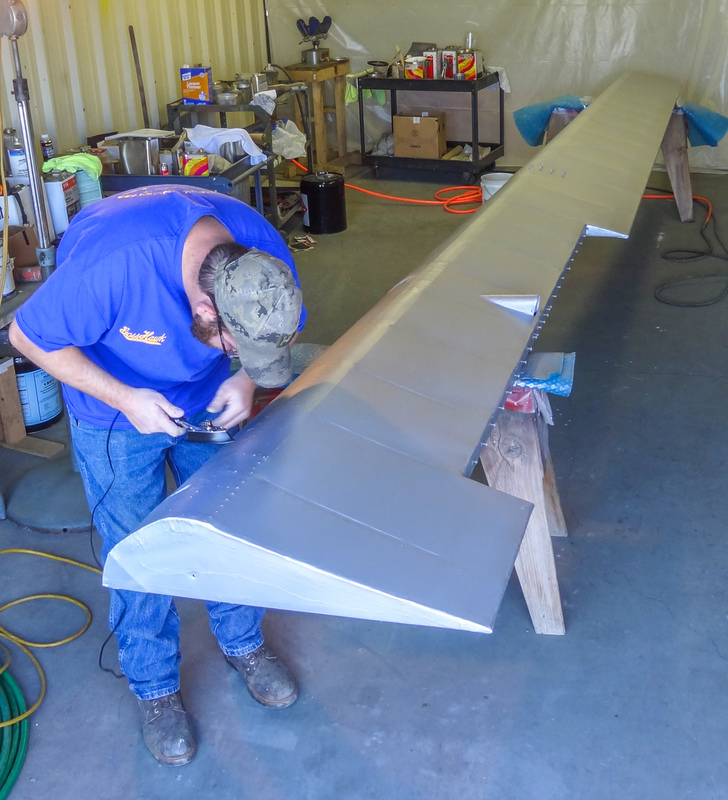 GossHawk is currently in the process of applying skins, while waiting for parts to help finish the fuselage which will be on their way from New Smyrna Beach, FL very soon. 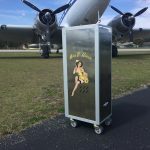 The wings are currently in New Smyrna Beach, FL with another shop, and the BMW 801 engine is under rebuild with Mike Nixon in Tehachapi, California. 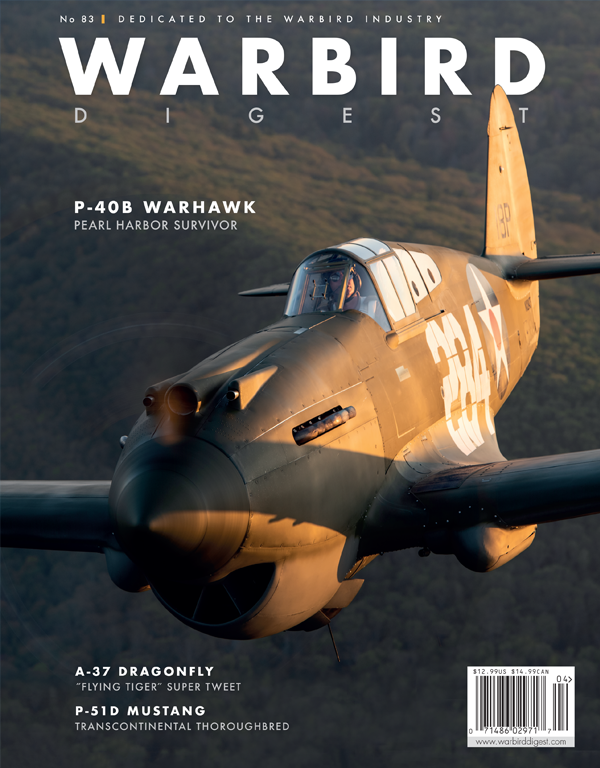 The WarbirdsNews editorial team wishes to thank GossHawk Unlimited for their strong participation in putting this article together, and in particular to Lindsey Goss for her tireless and patient responses to our questions. We also wish to thank GossHawk Unlimited and Zdenek Kaspar for the use of their beautiful photographs in illustrating the article as well. 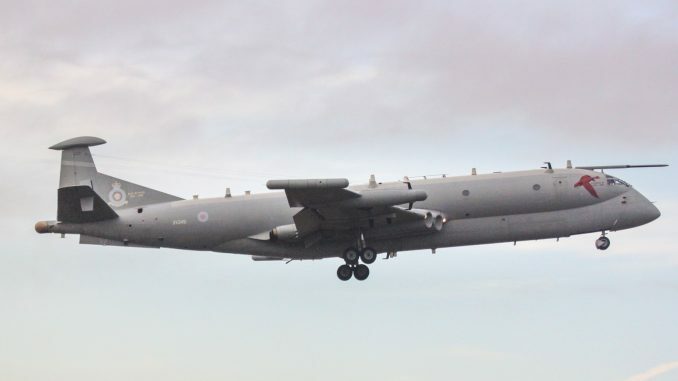 Is it just me or does the red line in the STAR & BAR not belong on this aircraft. 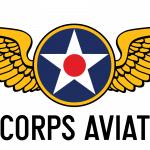 The red bar was not added until after the creation of the USAF in 1947. Every picture I have seen of a Privateer is minus the red bar. As it happens, this particular Privateer is a former post-WWII coast guard example. 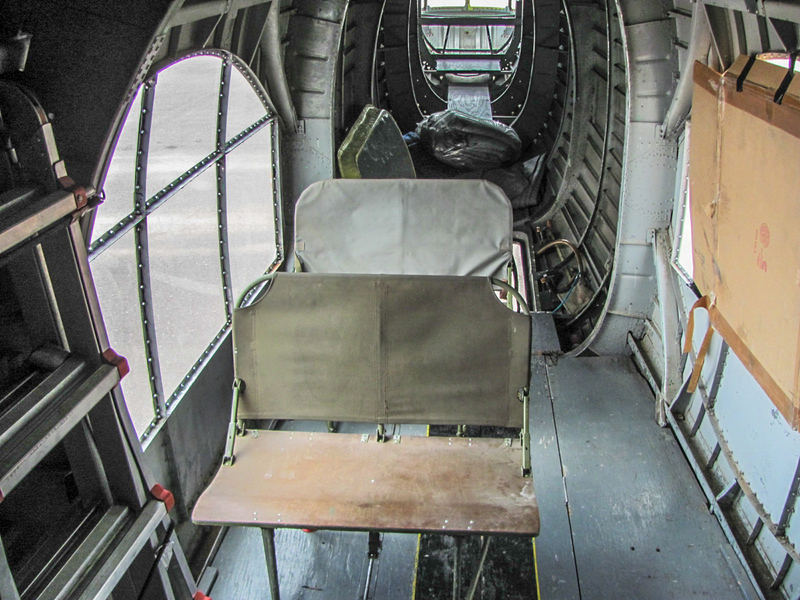 The Coast Guard modified the aircraft greatly, with the removal of the gun turrets, and placement of the huge green house nose and waist windows as well. As you will see in the period photograph on Wikipedia at the link below, US Coast Guard Privateers did indeed have the bar in the insignia. Great article and photos. Thanks for the work you do. and brought the warbird back for our viewing pleasure . Wish to thankyou for the great pictorial and editorial coverage on your restoration ,continious work on this old workhorse. 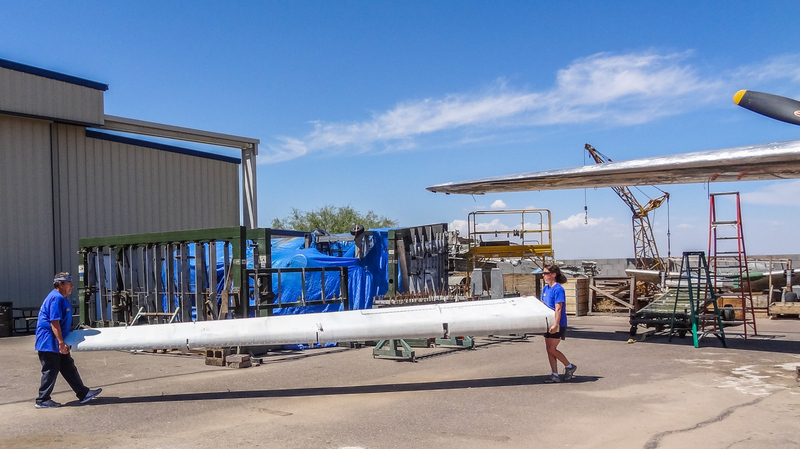 Im sure you did intinsive inspection of the ;Wings Spars.It,s been worked hard over the years! If i manage to go to one of the fly ins you might be at,i,llmake it a point to drop $20.00 in the pot towards your gas bill! it,s only a token but every bit helps. 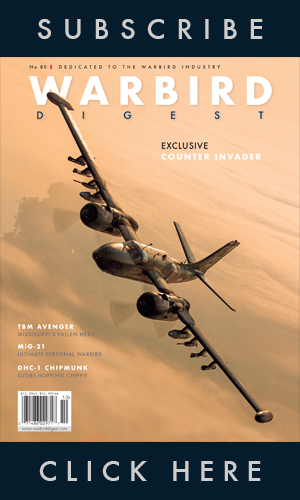 I read in the past,Air CLassic ets.you have B-25 Engs. and nacellss on A/C? Many thanks for your comments Bobby. 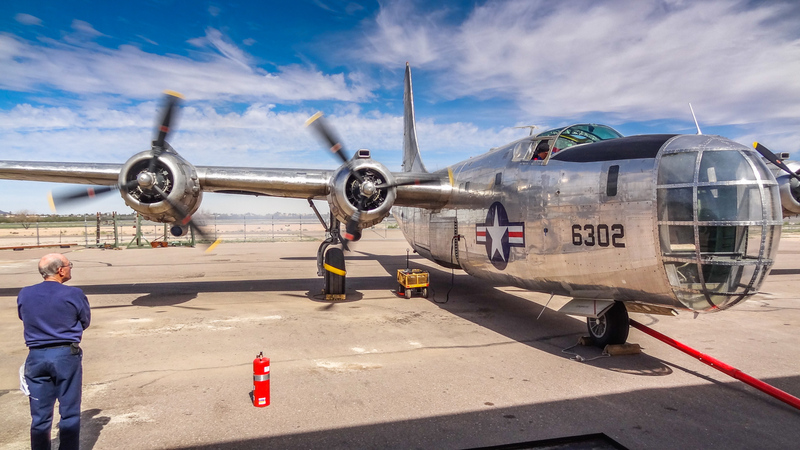 You are right in that the Privateer was upgraded with R-2600 engines and cowlings from a B-25 during its days as a firefighter (as were most/all Privateers). I’m very pleased you liked the article too. 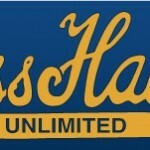 Lindsey Goss at GossHawk Unlimited helped us so much with getting answers to questions and the wonderful photos too. It was a very enjoyable piece to put together! 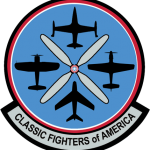 hey bob, it’s great to know that there is another me that likes classic warbirds as much as i do. 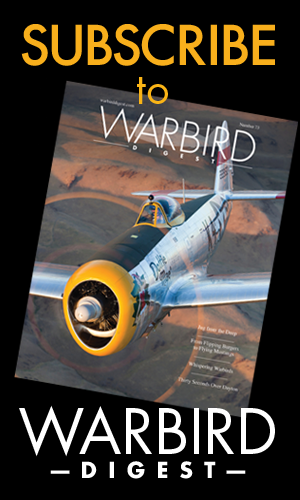 Dido to the :Warbirds.News EDITORAL Staff for their efforts in presenting this news articlwe. 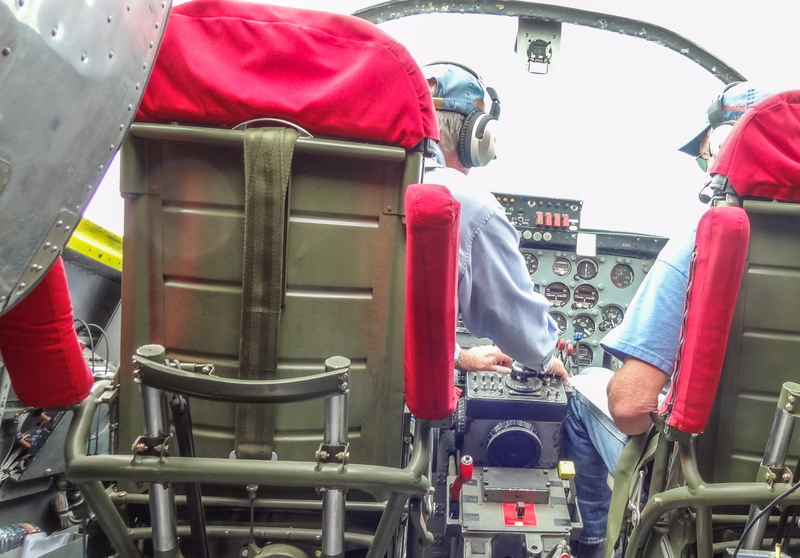 I just got to check out old tanker 121 in Oshkosh last week. I worked on that aircraft years ago at H&P. My compliments on the hard work, aircraft looks great. Sure brought back some memories! Congratulations on a wonderful quality restoration. 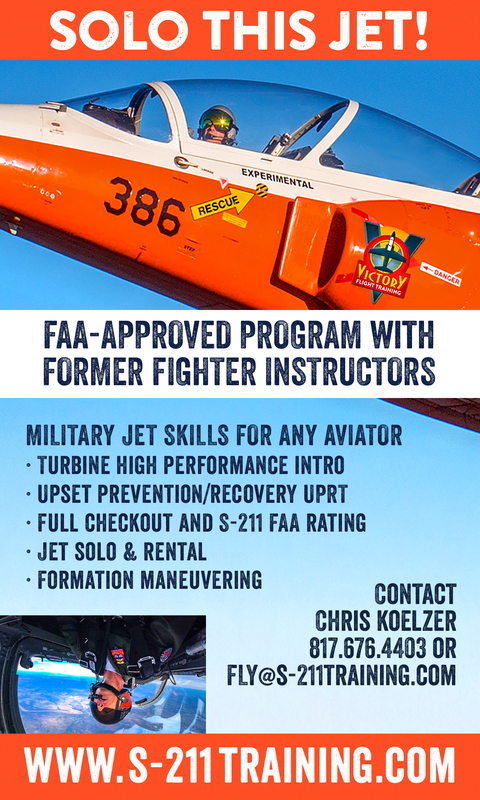 During my tenure in Alaska I often entered Ft Wainwright in the 1970s to shoot aircraft and H&P Aviation Privateers were parked in the BLM area for summer fire fighting duty. I wonder if this bird flew out of Wainwright and what the tail number was back then. The military number was…I might have a photo; my collection has both the H&P silly-villian and military Navy and maybe CG images. Good fortunes with the aircraft projects. Many thanks for the message Dave… we’d love to see some of your images from back then if you are up for sharing a couple. The Bu.No. 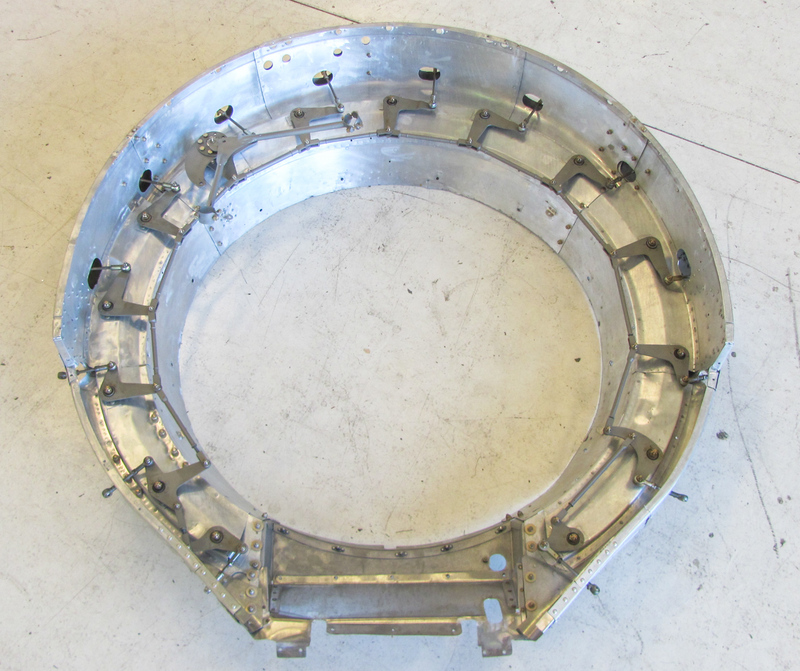 for this airframe is 66302. From what I can gather she’s worn several tanker numbers. When she flew for Avery Aviation between 1959 and 1969 she apparently wore the numbers A20, A23 and B21. 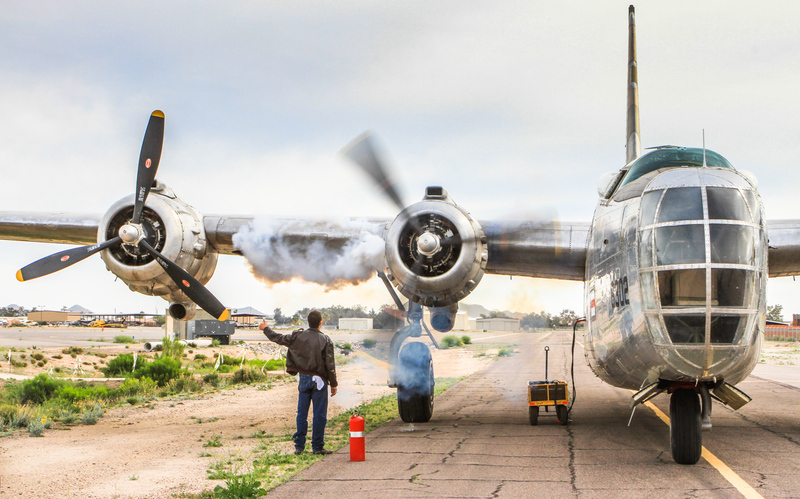 When Hawkins & Powers owned her it was simply tanker 121. Do any of those numbers ring a bell? Thanks for all of your hard work. Looking forward to seeing your handiwork in Michigan. I have a photo of this Privateer when it was wearing Avery Aviation’s #A20 in 1969. It was in Air Classics magazine issued in February 1992. I’d be happy to email a copy to you. Tom please send it to us > info@wrbirdsnews.com – Thank you! I bought a tee shirt and cap during Oshkosh this year to memorize my fathers flying the same model during ’44 out of Kaneohee. Another crew member was there the same time, now living in a retirement center in West Des Moines, IA. I gave him the tee shirt as a token of my appreciation for his contribution. He was extremely happy for the gift. Only wish I could do more for him. I have my dad’s pictures of his crew and his log books. 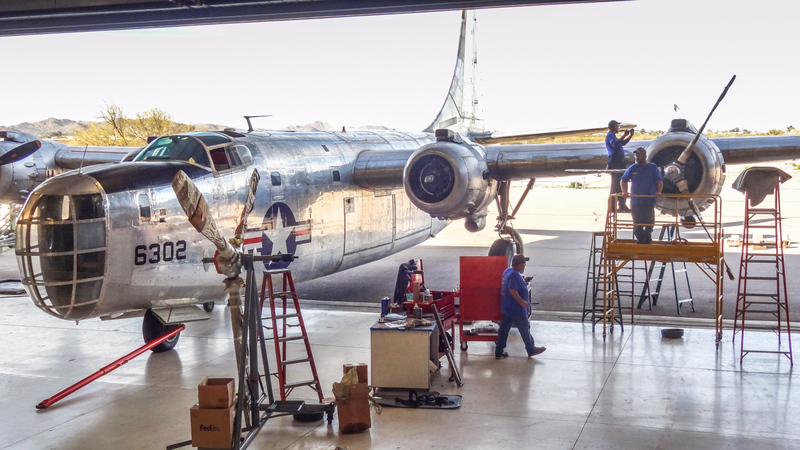 Thanks for restoring a beautiful plane to keep that part of history for us younger generation. I have just come across this article and your comment. My father, Joe Walter, flew in to Kaneohe Dec. 24, 1944. 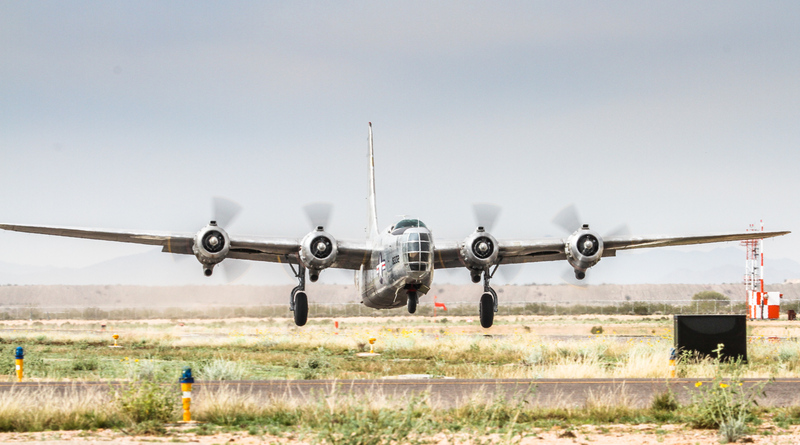 His squadron of PB4Y-2’s, VPB-119, then made their way to Clark Field. Were they in the same outfit? 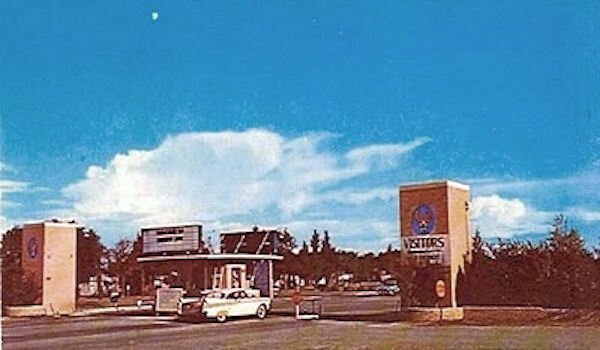 I tracked down this website while doing research on some of the old fire bombers that use to operate out of Redding, CA during the Seventies. 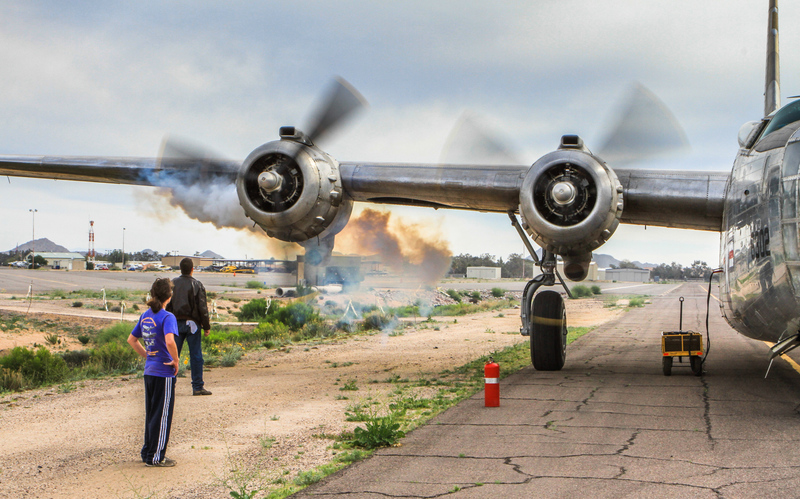 I loved the sight and the sound of the planes when they were fighting the fires nearby. I have a couple of old phots of P4Y-2 (N2871G) taken in 1977. You are more than welcome to them if you want jpg images that can be emailed. The photos only show a rear view of the plane with the N number visible. One day my Dad took me with him to NAS Miami-Master Field just blocks from our home to visit a friend who commanded a Marine Reserve squadron there. We entered into a large dark hangar (today this hangar is part of Miami-Dade College and was a gymnasium for many years). Inside was a very large black, actually faded glossy sea blue and very sinister looking aircraft. To a young boy this was an impressive, but scary experience. The main tires were taller than me and the menacing bow turret and multiple electronic “warts and bumps” all over the forward fuselage and the huge tail made it look a winged dragon. Although I liked aircraft a lot, this one was very ominous. 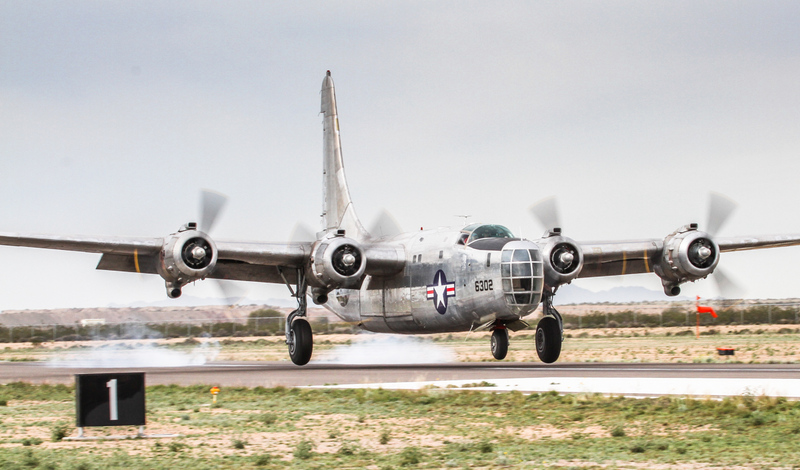 What I saw was a Consolidated PB4Y-2M Privateer of VP-23. 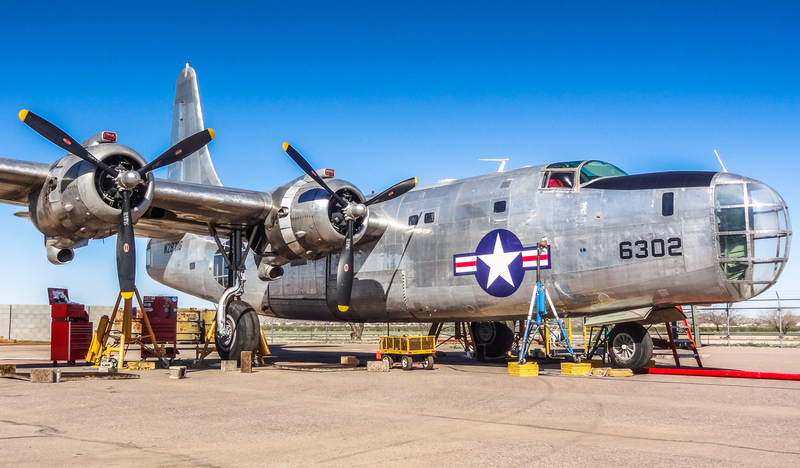 VP-23 had 9 of them stationed in Miami from 1948 thru 1953 until they were replaced by Lockheed P2V-5 Neptunes when VP-23 moved to NAS Brunswick, Maine. 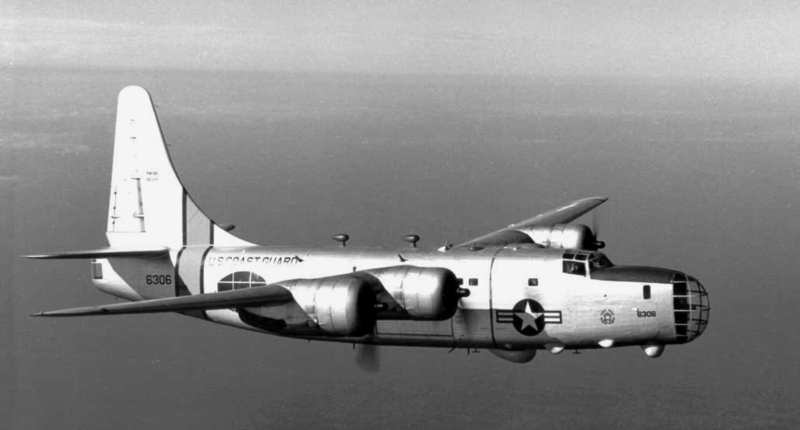 These aircraft served a dual mission as anti-submarine/shipping patrol and as hurricane hunters prior to a time of weather satellites and powerful weather radars. 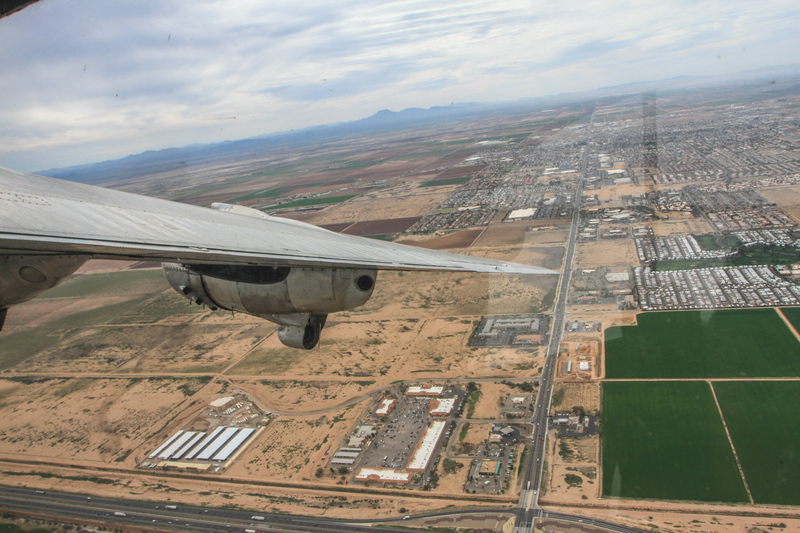 During the 1950 hurricane season, VP-23 entered the eyes of 33 hurricanes during a very active season. On 18 Oct 1950, Hurricane King struck Miami with 125 mph winds. 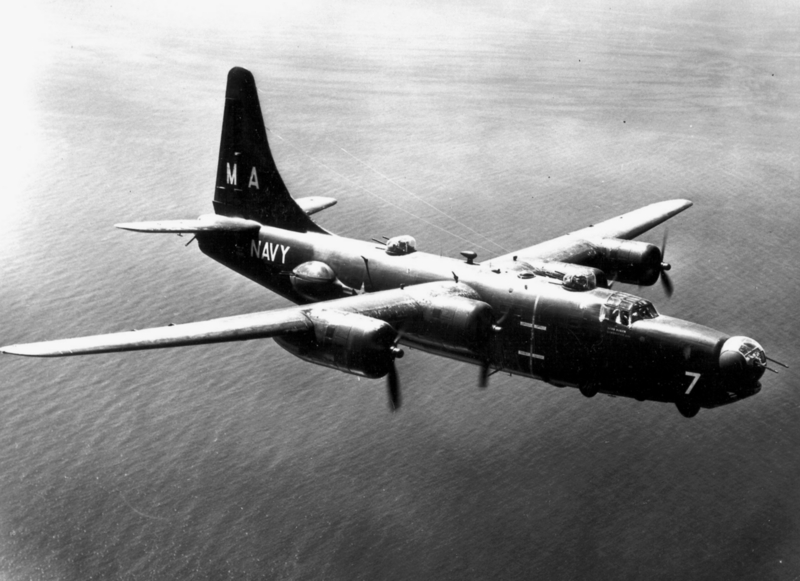 For unknown reasons, VP-23 did not evacuate their Privateers but tied them down and manned them with minimal crew and with engines running pointed them into the wind. Everything went OK until the wind shifted suddenly and the tall rudders were blown completely off the vertical stabilizers. There was an official hearing and the CO was exonerated of any wrong doing. Great job of bringing this one back….I look forward to seeing it! Awesome restore. Little sad not fire bombing anymore, watched you a lot out of Ryan field. Saw you yesterday at Chino planes of fame, and you just buzzed near my house today following the Hwy 60 back to AZ. 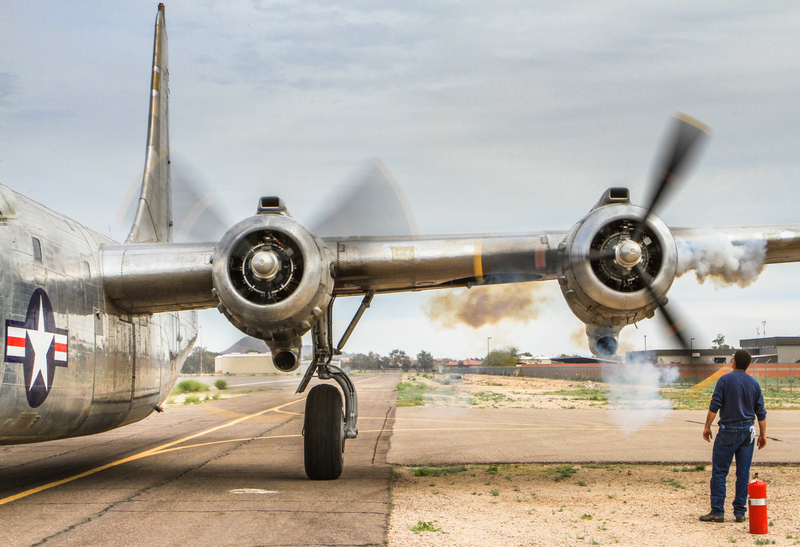 Those radials just give me goosebumps. I’m disappointed by this. They should have preserved the firefighting markings. They look so much more unique, and tell of the plane’s unique history and work as a firefighting craft. Not everything has to be a generic warplane.